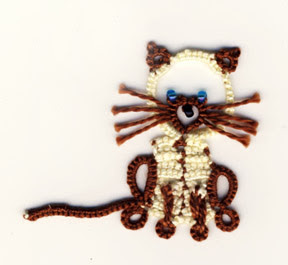 I have been making lots of tatted cats from Martha's book and wondered if it would be possible to make a Siamese cat in tatting. Siamese cats are so different in appearance with their blue eyes that it is hard to imagine how they are related to the ordinary 'moggie'! My first attempt was not too great. 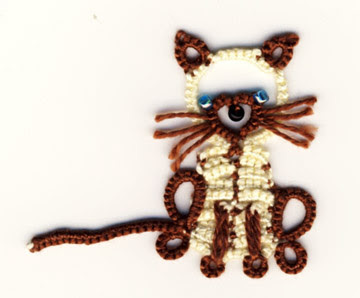 With a little bit more jiggery pokery, SLT's, lock joins and tweaking the stitch count I arrived at the perfect Siamese kitty who is soooh cute! Tho I do wonder if the upper hind leg should be cream and the ears even larger. He is made in Madura Coats Anchor perle 8. The soft lustrous perle cottons work really well with block tatting. The dark colours seem to be thinner than the pale ones which affecs the stitch count. He is 4cm tall and once you get the hang of it is easy to make. I love this kitty. Very Siamese in appearance. Looks mischievous too. What a cute little kitty. I have always wanted a Siamese cat. Maybe this would be the best kind to have. This is wonderful! I might just have to go and get Martha's book. Number 18. Just a little mouse! Number 17. Pigs might fly! !